From time to time, I like to venture outside the ‘creative square’ so to speak. 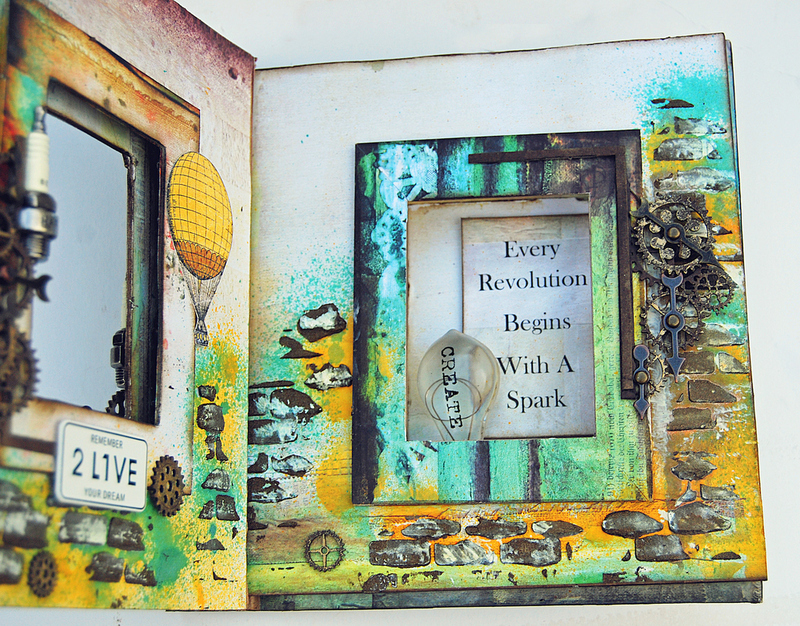 This time a quote from the ‘Hunger Games’ movie- ‘Every Revolution Begins With A Spark’ provided the initial creative ‘spark’ for my altered album. 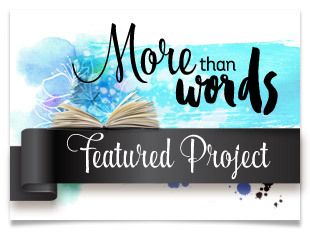 This started out as Paper Mache Book Album. So for something a little different, I converted the album into a 3D ‘art’ book. 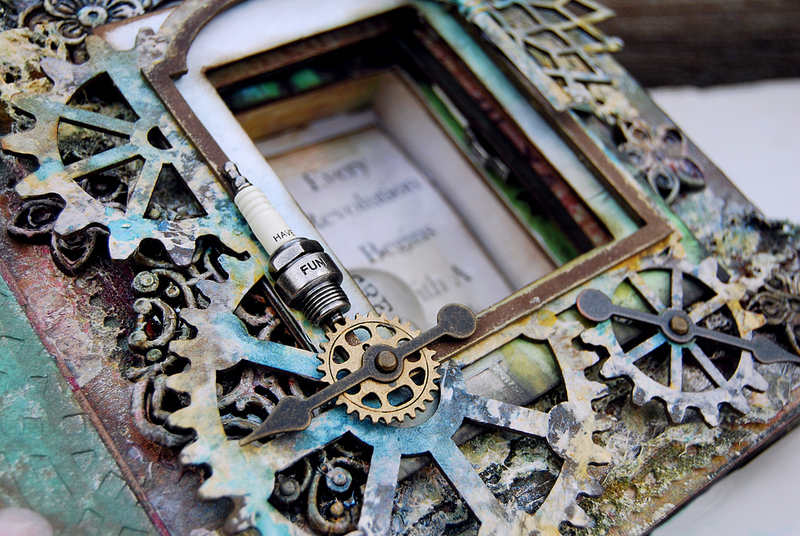 Texture and detail were added with layers of patterned paper, lace ribbon, canvas, gauze, button trinkets and mixed media. 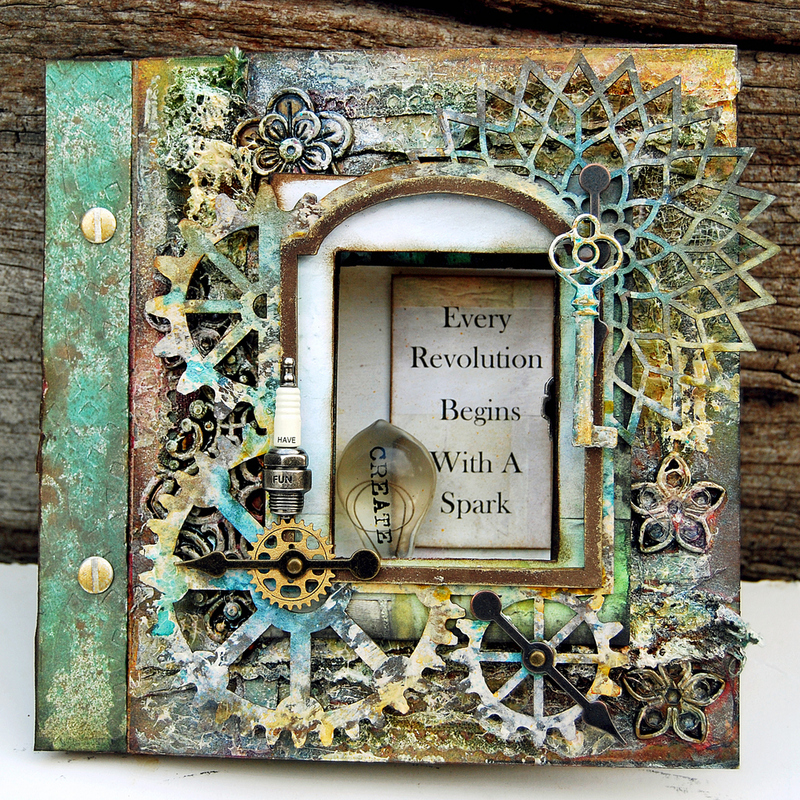 Chipboard cogs, gears, sprockets and metal game spinners have been incorporated into the design to evoke the rotation of moving parts synonymous with the word ‘revolution’ from the quote. 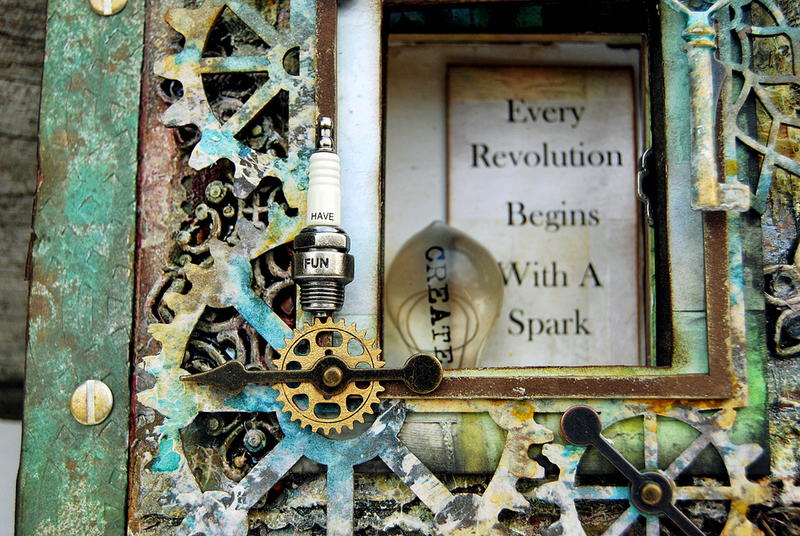 Whilst light bulbs and spark plugs are the ignition for spark. The blank pages of the album were used to create the shadow box effect by being adhered together. A middle section was removed by using the front cover’s window as a template. The back cover of the book had a similar opening and was then attached to the reverse side of the adhered pages. 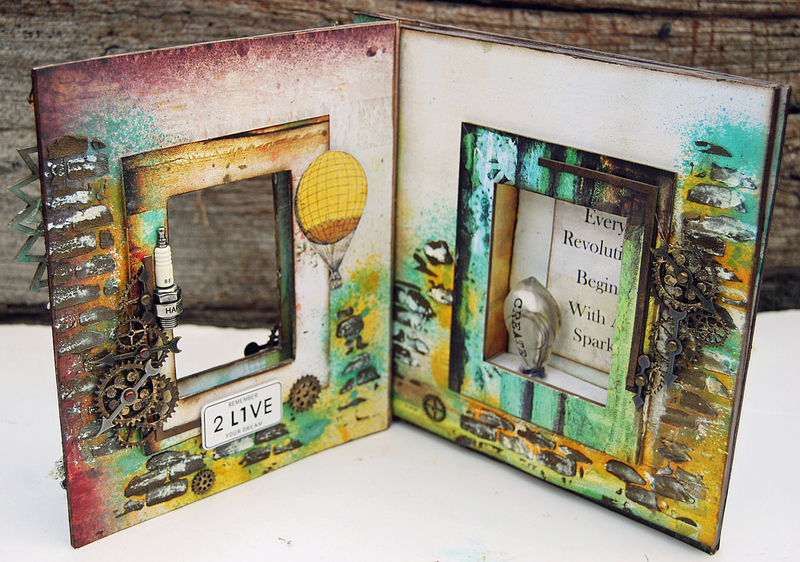 A smaller ATC sized shadow box was constructed and then inserted into the cavity created. The front cover attached over the top creates the 3 dimensional effects. 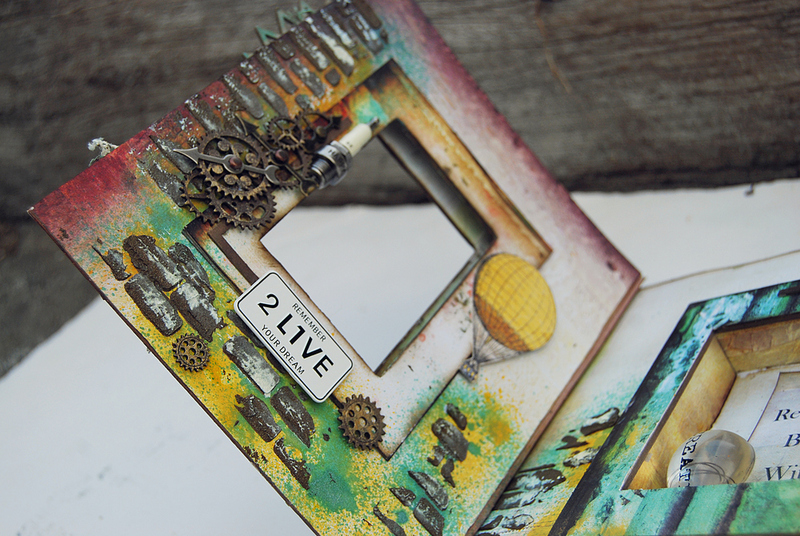 Mixed Medium detail added with a brick stencil, antique gold texture paste and colour mists. Chipboard elements were inked brown and then highlighted with a subtle dabbing of metallic gold paint.